Prof. Oh-Hoon Kwon (School of Natural Science) is posing for a portrait with the ultrafast laser spectroscopy in the background. 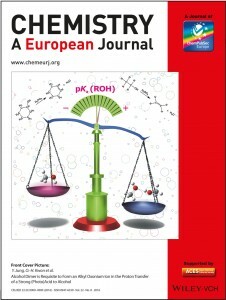 Featured as a 'Hot Article' on the front cover of Chemistry: A European Journal. 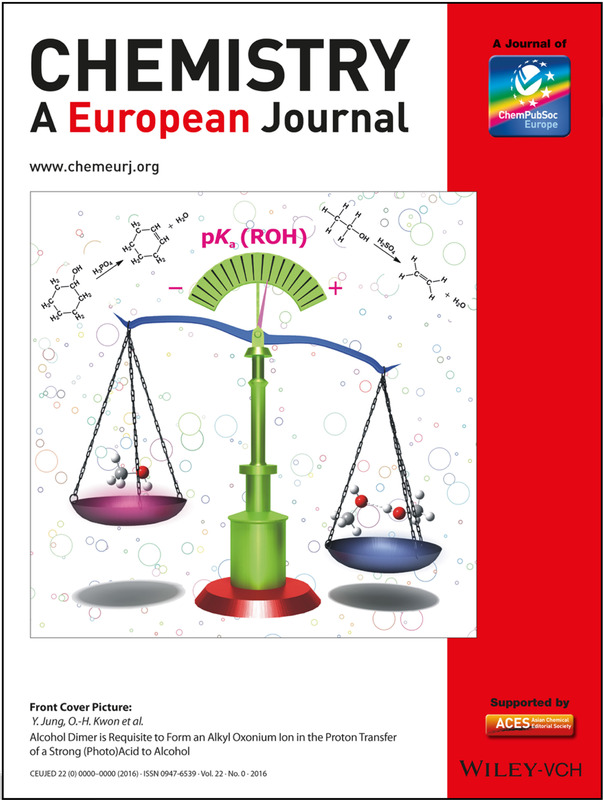 A new research, affiliated with UNIST has been featured as a ‘Hot Article’ on the front cover of the March issue of Chemistry: A European Journal. This study has been regarded as “very important” because it offers a new framework for understanding reactions in organic chemistry. The key finding of this study is the basicity enhancement of an alcohol by hydrogen-bonded clustering, the team reports. The study was jointly conducted by Prof. Oh-Hoon Kwon of Department of Chemistry at UNIST and Prof. Yousung Jung of Graduate School of Energy, Environment, Water, and Sustainability (EEWS) at KAIST, and three other researchers. Prof. Kwon’s work has been selected to appear on the front cover of the Journal of Physical Chemistry Letters. In the study, Prof. Kwon’s team addresses the cooperative role of alcohols, the simplest organic protic compounds, in one of elementary reactions in chemistry, the acid-base reaction, in a quantitative manner. In the study, the formation of an alkyl oxonium ion, which has long been proposed as a key reaction intermediate in alcohol dehydration, is studied by time-resolved fluorescence quenching of a strong photoacid. Their results revealed, for the first time, that the collaboration of two alcohol molecules through hydrogen bonding is critical to enhancing their reactivity and promotes the resulting alcohol cluster to form an effective Brønsted base when reacting with an acid as strong as sulfuric acid.